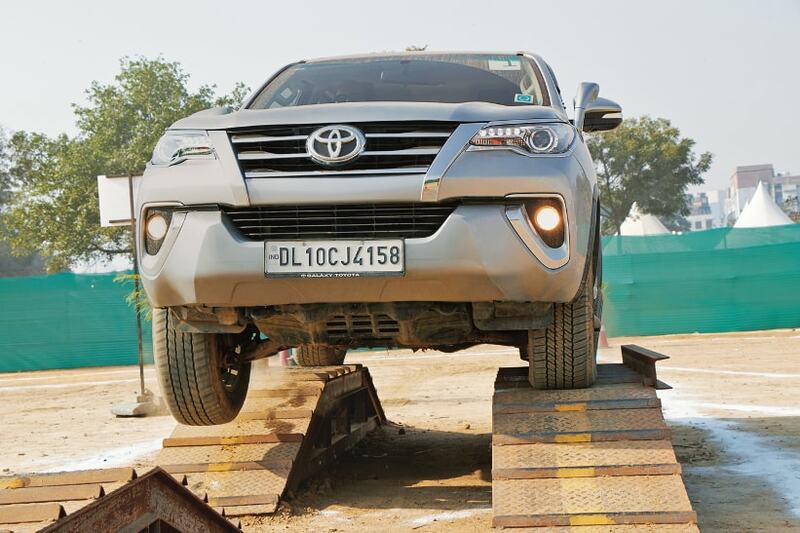 On 22nd February, Gurugram, 2018: Toyata Motor organized an Exclusive Fortuner off – road camp in gurugram, to showcase the SUV’s off road skills. Honestly, saying Toyota Fortuner is being the most loved SUV for all time with fully loaded features either in performance, or stylish appearance. The reason behind organizing a camp like this is only to give a opportunity to experience off-roading capabilities of the SUV like side inclines, water wading, slush pit, gravel pit, big mound, deep ditch and many more. The all new 2nd Generation Fortuner is designed too being tough and left the cool impact on the viewer with enormous power, exceptional ride comfort, premium features and top-class safety & security. comes with the 2.8L diesel with an 6 Speed Automatic Transmission with sequential and paddle shifters and 2.7L petrol engine, giving an outstanding performance of 177 PS and 450 Nm torque for 2.8L and for the being distinctive 166 PS & 245 Nm for the 2.7 L petrol. Sharing his thoughts on the event, Mr. N.Raja, Deputy Managing Director,Sales&Service Toyota Kirloskar Motor said, “The Fortuner, time and again has proved its meticulousness in adapting to most demanding and unconventional of terrains. Since its launch in 2009, Fortuner has received wide acclaim and popularity in India, for its on-road as well as off-road abilities that have been loved by one and all. We at Toyota, consistently work on observing various changes in the market and augment our products on the basis of customer requirements. This challenging off-road camp gives our existing and potential Fortuner customers an opportunity to experience all-terrain track ridden with steep inclines and descents, slush and deep water to experience the on and off-roading capabilities of the Fortuner. Previously organized in New Delhi, Bangalore, Mumbai and Panchkula, these events have thrilled participants from the vantage point of a tough off roading fan. Such events only give us an opportunity to build the Fortuner community and connect with Toyota fans across the country.” he added. Talking about the safety features in the car, the car is 4 wheel disc brakes with Antilock Braking system (ABS), Electronic Brake force Distribution (EBD) & Brake assist as well, with 7 SRS airbags, for the front seaters company has added the feature called WIL – Safe (Whiplash Injury Lessening), All row three point ELR (Emergency Locking Retractor) seatbelts with Pre Tensioner & Force Limiter in front row and many more. If we look on the stylish and attractive exterior and interior features, the Toyota fortuner is full of being tough and cool at the same time with the wide imposing grille, Auto Bi-beam LED with DRLs, added urban alloy wheels size of (17” & 18”), LED rear combination lamps with aerofins and fog lamps. With all this exclusive feature, car is smart in itself too, there is automatic idling Start & Stop in Deisel auto transmission. All new dark brown interiors, LED coordinated cabin lights, Tilt & telescopic steering column to drive according to comfort level, parking assistance with back monitor and rear sensors. The car is available in 2 variants – 2.8 L diesel engine and another one is 2.7 L petrol engine, both the engines comes with 6 speed automatic and there is 5 speed manual for the 2.7 L petrol.